Be a Vermont Reads participant! You can check out a copy of the book at the circulation desk in the library. We have multiple copies. If you want to get a jump on 2019, the 2019 Vermont Reads book is March: Book One, the first of a trilogy written by civil rights icon John Lewis, in collaboration with co-writer Andrew Aydin and award-winning graphic artist Nate Powell. 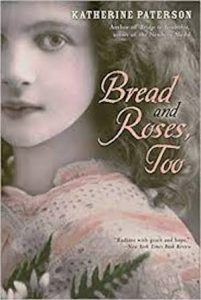 *You might know some of Katherine Paterson’s other books like Bridge to Terabithia, Jacob Have I Loved, The Flint Heart, The King’s Equal, or The Day of the Pelican, which was 2010’s Vermont Reads book. Mini-golf in the Library for Homecoming! October 17, 2018 by Charlotte Gerstein in News | Comments Off on Mini-golf in the Library for Homecoming! 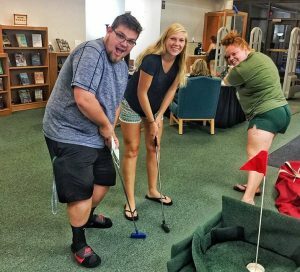 The library is hosting mini-golf again this year during Homecoming! 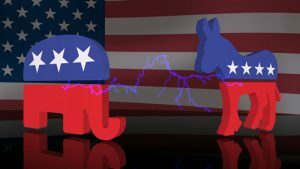 It’s an electrifying time of year, time to prepare to vote in local and statewide elections, and for Representatives and some Senators in Congress. The Library’s mission includes providing our community with resources to be engaged citizens. Check out our book display on voting and elections and the issues at the forefront of the 2018 General Election. For Vermonters already registered to vote: See the Vermont Secretary of State’s website for voters about where to vote and what will be on your ballot. For students from any U.S. state who want to vote in Vermont, you can register to vote up to and including the day of the election, at the polling place. More info and online registration here. If you live on campus, you can use your dorm address (below). The polling place for Castleton is the Fire Station at 273 Route 30 North. For students from any U.S. state who want to vote absentee in your home state’s election, see Absentee voting from Ballotpedia. Being a college student living in another state is considered an “excuse” for an absentee ballot. Pay attention to deadlines for requesting a ballot. To see how badly your vote is needed in your state, you can check out Ballotpedia’s analysis of how contested certain seats are. To learn more about the U.S. government and political parties and elections, you can get up to speed with this video series from Films on Demand: U.S. Government: How it Works (subscription material, log-in required for off-campus access). For clarification of terms like liberal, conservative, Democrat, Republican, left, right, see this infographic. October is here and library staff are feeling the Halloween spirit (or spirits! 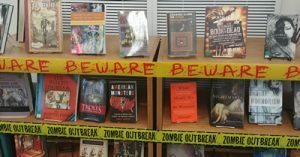 ), especially Access Services Librarian Steph Traverse, who put together a book display featuring all things spooky. Scary movies are on display in the DVD collection too. Check out the spooky material Credo Reference has put together for you, and check out this clip from Films on Demand, What Happens to Our Brains When We Get Scared (subscription material, log-in required for off-campus access).